by K. Brynolf Lyon, Dan P. Moseley. Abingdon Press, 2012. The authors are practical theology professors and congregational consultants interested in the hurt and loss that undergird much congregational conflict. 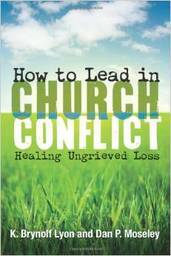 This book invites leaders to focus on helping congregations grieve and heal, rather than simply seeking to address and solve presenting issues of conflict. Through case studies and theological reflection, they discuss both the practical and the spiritual dimensions of the failure to grieve and offer thoughts on leading a congregation through the emotions associated with loss, including anger, guilt and shame, and renewal. A final chapter speaks to preaching and liturgy in a time of conflict and loss, using the liturgy as ‘container’ for the emotional and spiritual process occurring in the congregation. Clergy and lay leaders will find this book helpful in thinking more deeply about the emotional and spiritual life of a congregation with trauma or loss in its recent or distant past, or a congregation struggling with the losses associated with change.